The band directors appoint the student leaders of the Grissom High School Band after auditions, interviews and essays have been received. All students are looked upon as potential future leaders from the time they enter the band program as freshmen. These positions are all full year appointments, even though some duties listed below may refer only to Marching season. All students appointed as leaders shall, in addition to their listed duties, strive to uphold the image and spirit of the band at all times. These appointments are to be considered an honor and a responsibility, not a privilege. Leaders should aid the band directors in every way possible. Please be aware that all leaders are to be available to teach or help teach at all camps for Marching and Symphonic/Concert Band. You are expected to keep the lines of communication open between each other and between students and the directors at all times. Leadership positions include: Band Captain, Drum Major, Section Leader, and Color Guard Captain. Enforces band rules and maintains order. Maintains "esprit de corps" within the band. Makes announcements to the band as directed or when the need arises. Sets up Marching Practice Field for rehearsal. Sound system, yard line markers, etc. Conducts warm-up exercises with Drum Majors at marching rehearsals. Oversees section leaders during marching rehearsals. Meets periodically with section leaders to assist with any problems that may arise. Assists section leaders with uniform inspections. Keeps records of improper uniforms. Checks section leaders’ attendance notebooks periodically and enters absences into Charms. Checks attendance at each after school marching rehearsal enters absences into Charms..
Reports any major problems to the director. Assists the band director in all ways possible. Helps with the organization of the annual Band Banquet. Qualifications include: Senior (12 Grade) only, proficient on instrument, ability to communicate one-on-one or speak in front of a large group. Enforces rules and maintains order during marching rehearsals. Conducts warm-up exercises with Band Captains at marching rehearsals. Directs and controls the band in field rehearsals and performances. Assists the Band Captains with uniform inspections and overseeing section leaders during marching rehearsals. Conducts and is in charge of pep rallies. Conducts the bands in the stands at football games. 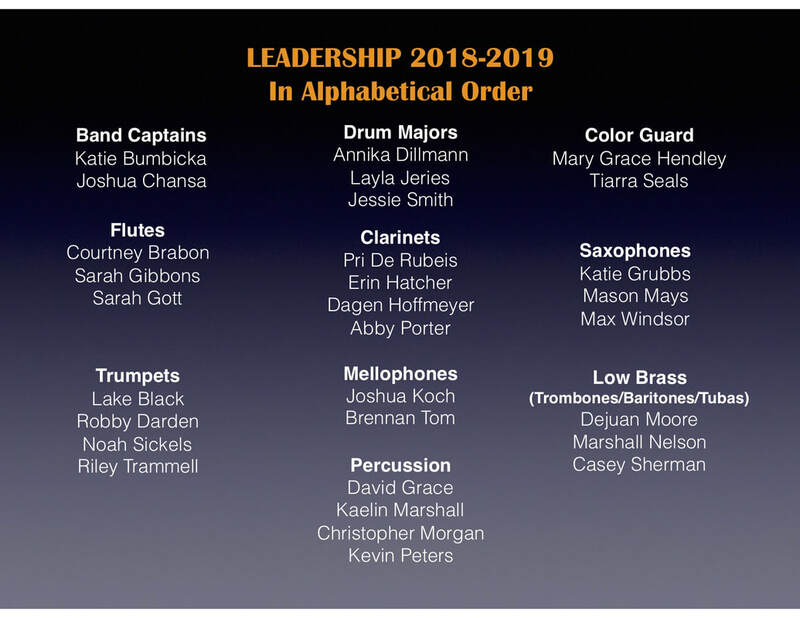 Qualifications for Drum Major include: proficiency on respected instrument; ability to read musical score; ability to properly warm up band; at least one year’s experience in Grissom High School Band. Is responsible for section’s marching and playing performance on the field and behavior in the stands. Keeps a daily record of attendance in designated notebook and reports to Band Captains any absenses. Inspects uniforms of section members. Attends all meetings called by the Band Captains or Band Directors. Reports any problems to the Band Captains or Drum Majors. Issue school instruments at the beginning of summer/fall semester. Issue and collect instrument rental forms. Assigns cubbies to all students in your section. Helps to keep your instrument cubby area clean. Qualifications include: 1 year experience in Marching Band; proficient on instrument. Directs percussion rehearsals during the summer and the regular marching season. Is responsible for seeing that all percussion equipment is put in its proper place after each rehearsal and kept in an orderly manner. Makes sure that all rehearsal sites are clean before leaving. Helps keep percussion areas in the band room clean and organized. Oversees the loading and unloading of all percussion equipment at all band functions. Keeps a record of all issued equipment and its condition. Reports any vandalism to the band director immediately. Helps keep percussion equipment area in the band room organized and clean. Organizes and directs Guard morning rehearsals during the summer. Assists in teaching the marching show to the Guard. Oversees the loading and unloading of all guard equipment at all band functions. Qualifications include: one year’s experience in the GHS Guard (Marching Band). Keep music library neat and orderly. File and copy music as needed. Make up marching folders with music for all sections during the summer. Keep the music index up to date. Aid in passing out new music and collecting and filing it at the end of the year. Appointed by Band Directors and previous year's returning truck crew. Collect lists from section leaders (especially sousaphones), Drum Captains and Guard Captains of what is to be loaded. Load and unload all equipment and uniform carts for performances throughout the year. Check to be sure that everything is tied down securely before truck is locked. Check with band directors to ensure that all equipment is loaded. Arrive at all marching performances 30 minutes before reporting time to unload all equipment in an orderly and safe manner. Change into uniform after all cases are put back on the truck before performance. Leave the stands early to change out of uniform and get cases out and ready to load. Check to insure that all uniforms are hung up neatly and in order before dismissal of each cart. Unload equipment at school after performance and clean out truck for return to rental company. No student will be allowed to drive the equipment tractor (Gator) at any time. Setup and take down all equipment for all Symphonic/Concert Band performances (local and out of town). Change set between bands on stage for concerts, MPA, spring trip, etc. Load/unload truck for all Symphonic/Concert Band performances as needed and acquire loading lists for each band. Appointed by the Band Captains and or Chaperones with approval of the band director for a specific trip. Maintains order on all bus trips. Takes roll each time buses are loaded. Informs chaperones of any problems. Checks bus at the end of trip for leftover articles and brings them to lost-and-found in band room. Makes sure bus is clean by picking up trash and depositing in trash bag. Assists the chaperones in every way possible. Qualifications include: one year's experience in GHS Band.